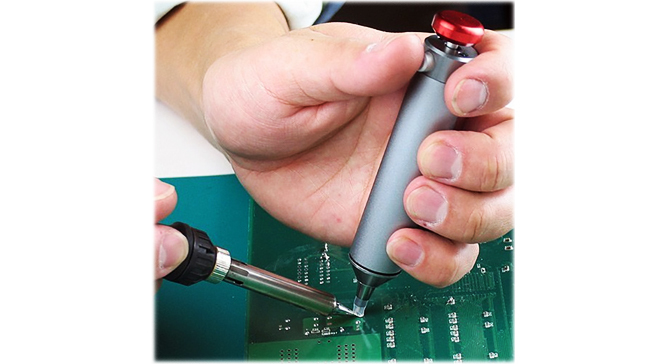 A “solder sucker,” or desoldering pump, is basically a hand-powered vacuum, designed to rapidly draw in small amounts of molten solder. 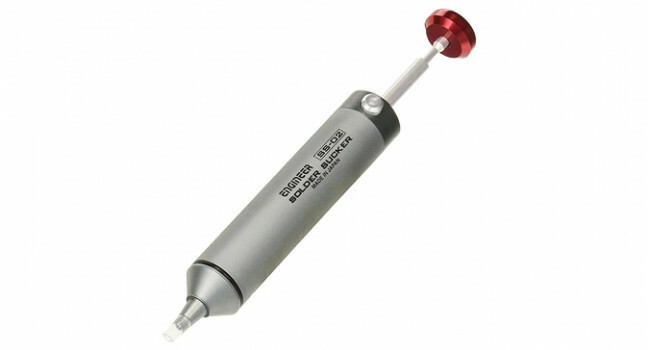 What’s unique about the Precision Solder Sucker tool is that it has silicone tubing as a tip, instead of the usual hard plastic nozzle. It also comes with an extra length of clear tubing to cut replacement tips from, and you can buy more if or when need more. To operate the Engineer Solder Sucker, you press down on the red plunger until it locks. Apply heat to the solder you wish to remove, and once it’s molten, position the Solder Sucker tip over the solder and press the side release button for quick suction. DEKKA DS3000 Desoldering Iron 30W The DEKKA DS3000 is a basic desoldering Iron and we were quite amazed how effective the desoldering works. If you desoldering small surface mount components this m..
DEKKA Soldering Iron 30W We tested about a dozen of entry level irons and selected the DEKKA 503 as our entry level iron. 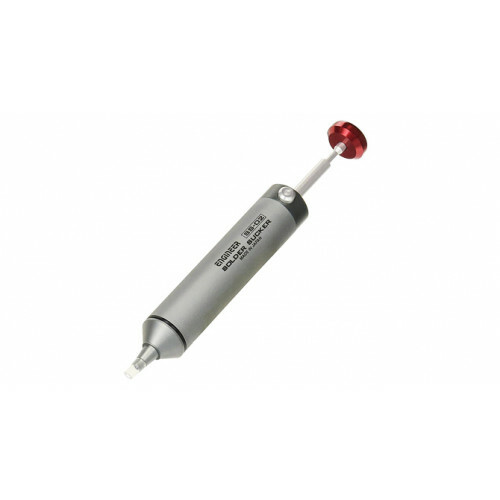 This is a fixed temperature soldering iron with great temperature sta..
DEKKA Soldering Iron 50W This is a very simple fixed temp, quick heating, 50W 220VAC soldering iron. We really enjoy using the more expensive irons, but if you really need a entry level soldering i..
Desoldering pump Desoldering pump for soldering Shipping List 1 x Desoldering pump ..
OLED 0.96" Display I2C Interface White These displays are small, only about 24mm diameter, but very readable due to the high contrast of an OLED display. This display is made of 128x64 individual w..
MicroSD USB reader This is an awesome little microSD USB reader. Just slide your microSD card into the inside of the USB connector, then stick this into a USB port and the card’s contents will pop up..
DIATONE 3X4 2812 LED Matrix 5V The 2812 series of LED's from Diatone all contain 2812 programmable LED's. These LED's can be programmed via Betaflight and Cleanflight. These LED's require 5V and will..